Rosemary Lord wrote her first book when she was ten years old – for her little brother. She also illustrated it herself. It was later rejected by Random House! She has been writing ever since. 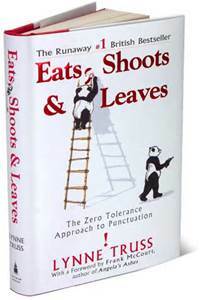 So, no wonder Eats, Shoots and Leaves became so popular. It’s a witty reminder of the lessons we learned at school – but that seem to have vanished in today’s hurried world. Lately, I find I question myself as I’m writing, because much of what I read today has a different use of grammar from that with which I was raised. And I write the way I was taught. Not that I’m such a grammarian – and I probably could not recite the rules I was taught as a child. But I know that words and phrases with wrong grammar and punctuation just don’t soundright. Unless you are specifically writing dialogue with a dialect. Then the very miss-spoken words and incorrect grammar are what convey the character of that person. But, again, it’s the sound I listen for. It’s my instinct. Apart from intentional colloquial miss-spoken words, poor grammar and punctuation hurts. I love words and the ability to create something with them. So I don’t like it when people muck it up! My mother was a writer – of newspaper articles and magazine and radio short stories. Amongst other homilies, she would repeat, “different from – not different than.” “Yes Mum,” I would obediently reply, not understanding what on earth she was talking about. But it stuck in my brain somewhere. As a child, I had no interest in learning about grammar and punctuation. How boring, I thought, as I immersed myself in another book. I could not get enough of reading and writing my ‘little stories.’ Foolishly, I could not see where grammar and punctuation came into it. I was going to live in Hollywood, meet all those Golden Era Movie stars, write and work in HollywoodMovies…. What was I thinking? Now I devour any learning opportunities and wish I had paid more attention. I find books like Eats, Shoots and Leaves, to learn more. And so I write words as I hear them in my head – and follow my gut instinct, if something feels wrong. For instance, I was taught never to start a sentence with ‘and’ – and that you never have a comma before the word ‘and.’ However today, ‘the American comma’ as us Colonials call it, (also known as the Serial Comma or even the Oxford Comma!) is rampant and therefore acceptable. Still feels odd to me. But I am willing to entertain these new-fangled ways of writing. I just don’t have to like them. I do, however, like to capitalize words for emphasis: I’m sure there’s a rule about this that I break all the time. And (there – I started a sentence with an ‘and’ – bad girl!) I confess I am addicted to ellipses and dashes…. I sympathize! I read a lot of British fiction, and I'm always making grammar “mistakes” in my writing that are perfectly correct across the pond. I will forever remember that “a dove is a bird.” Thank you for that! If we writers would periodically read posts like yours, Rosemary, we would pick up those obvious mistakes we seem to all make. I do realize some grammatical standards change over time, though not always for the good, better or best. But sometimes I want to use the ellipse because I want the reader to pause for slightly longer than a mere comma. And as we all have learned, not all “experts” know what they are talking about. So… and… we shall all be rebels occasionally. Great post. What a fun, personable blog post. You write in such a friendly way that no one would even notice a beginning “and” in a sentence, a “dove” in the pool, or enough ellipses and dashes to spell out a novel in Morse Code! You make reading fun. I have to say something about that controversy in the “comma before the and” in a list of things. Newspaper Style books say to always put in, and so do I. Actually I'm comfortable with doing it all the time because if not, it seems like you are listing equal things, then all of a sudden you list the last two thnigs together. “I like vanilla, chocolate-chip mint, Rocky Road, and Strawberry ice creams” makes sense to me. I'm saying a different thing if I list “strawbery, chocolate, vanilla and orange sherbert.” Those last two BELONG together in a flavor that I call Cremecycle. Does that makes sense, or am I on a sugar high in a half gallon of delicious Peanut Butter Cup Vanilla ice cream? Haha! I still get confused with what is acceptable in America and frowned upon in England – and vice versa. Mad – that teaching really does stick, doesn't it? My mum was also taught by nuns: is there a theme here – writers taught by nuns? And – I was delighted when I discovered there was a word for my little dots…. Thanks for your lovely comments – and keep smiling! Thanks, Gayle. I think if we have the basic understanding of grammar, (wot we woz tawt as kids…) then our creative writer selves can take liberties when we need to. That's part of finding our own voice and creating characters, I think. Thank you, Jackie – I just love words – so I have fun with them. Wonderful post and such great advice. I think most writers grapple with grammar and punctuation, what IS right as opposed to what SOUNDS right. Ultimately commas are part of the writer's toolbox and are best viewed as tools rather than rules. If they make the meaning of the words clear, if they control the flow of words like a faucet, then isn't their usage correct? Great post, Rosie, and you made me laugh aloud with the Michael Caine anecdote. I have sometimes been accused of pedantry when I correct my friends' grammar (as in the proper usage of “I” vs “me” so I appreciate your raising the issue. I find I've gotten sloppier over the years, however. And (!) I love using “and” and “but” to start a sentence now and then; it feels like I'm defying some Higher Authority (see, I also capitalize.) Don't get me started on ellipses and dashes–I could not write without them. Thanks for an entertaining AND instructive post!!! Jax, who makes Peanut Butter Cup Vanilla ice cream? I gotta get me some. That's a good point, Miko. I think we should listen to our instincts about rules. As long as we know the formula – then we can bend the rules a little, in order to make our writing sound right. Thanks, Bonnie. That Michael Caine comment still makes me laugh whenever I think of it! And I, too, have become sloppy over the years with the 'ands', the 'buts,' my capitalizing and all those other things that my dad would frown upon. But I think that ultimately – it's part of writer's voice. We now get to choose, don't we? Jax: 'Write about what you know' may be a cliché – but it works. Especially for Sue Mcginty…. And I'm with Bonnie: who makes that ice-cream? Chiming in late as usual, Rosie, but I just wanted to tell you how much I love your post. It's as if you were right next to me, laughing and being serious all at once. Yes, we get to choose our voices and expressions – no, we don't have any excuse for maintaining ignorance. And, of course, I will use, defend, and enjoy my Oxford Commas!